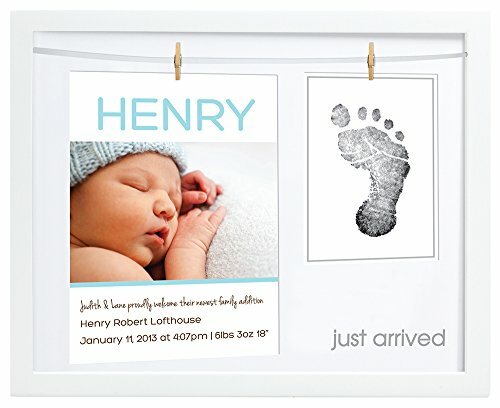 Mat is stamped in silver with "just arrived"
Commemorate your baby's birth with this classic wooden keepsake frame. Using the included wooden clothespins, you can proudly display your baby's birth announcement and their tiny hand or footprint. Making the print has never been easier. Just press your baby's hand or foot onto the "clean-touch" ink pad to reveal a detailed print. Your baby's skin never touches the ink, so it's completely mess-free. A perfect way to display a keepsake of your new arrival.